Malawi Link – The Parent Council held a Soup and Pudding lunch on Saturday 22nd May to raise money towards the visit of two teachers from our Link School in Malawi in August (if all goes to plan!). Thank you to everyone who came to support this – it raised the fantastic sum of £354. Especial thanks to the members of the Parent Council and others who made the delicious soups and puddings and helped on the day, and to the pupils who came along to help set up and serve at the tables. Roxanne Ramsay has also been raising money for the Malawi Link for the past year for the Volunteering section of her Duke of Edinburgh’s gold award. She has raised £250 in the last few months for the visit of the Malawian teachers, and this is in addition to the £422 she raised last year to help with repairs to the school buildings in Malawi. This is a tremendous achievement by Roxanne, especially as she has also been raising money for Project Trust this year. Roxanne was presented with a Young Quality Scot Award earlier this year in further recognition of her work in the community. Malawi Backpack Appeal – Gairloch High School has been involved with the backpack appeal for 5 years now and this year we are looking for more than ever. Help us by filling your old bags with school equipment and old clothes. You don’t have to fill a backpack, you could also donate spare bits and pieces from the list and we will sort them into bags. You can hand them into the school between 27th May and 25th June. You can hand your backpacks into the school office or one of the boxes around the school. Please do not donate anything that is not on the items list as this could cause problems with customs. View Donald MacKenzie’s web page by clicking here and read more here about the day spent preparing. S3 Drama Activity – On Thursday afternoon of Enterprise week 25 S3 pupils were surprised to discover that “Drama isn’t just acting”! It proved to be a fun-filled afternoon with a variety of activities designed to promote confidence and awareness of self and others, including the difficult art of keeping a straight face, tying themselves in knots (and trying to untie themselves!) and using their ingenuity, within small groups, to make a variety of “interesting” shapes. The pupils proved to be very ingenious indeed! Feedback indicated that the overall response was very positive with several pupils indicating they would like more such sessions. Thanks to Mrs Somers for organising this event. 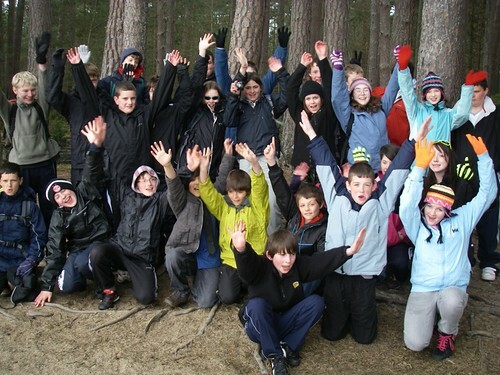 S1 at Nethybridge – Despite unseasonably cold weather for this year’s Nethybridge trip, the week from 10th to 14th May was enjoyed by all the S1 pupils. We started with an activity walk with the RSPB ranger to learn about Abernethy Forest and had hardly left the minibuses before we enjoyed the sight of 3 red squirrels playing in a tree, apparently oblivious to 27 excited S1 pupils (and staff!) nearby. Our kayaking, orienteering, mountain biking and walking activities on Tuesday alternated between sunshine and heavy snow showers, but the climbers avoided the snow by going to the climbing wall in Inverness because it was so cold, and we all had a good day. Wednesday was a bit warmer and no snow with the walkers scaling Meall a’Buchaille, the climbers tackling Cummingston sea cliffs in glorious sunshine, and more mountain biking, kayaking and orienteering enjoyed too. Thursday saw the traditional visit to Landmark for fun on the flumes and many other attractions. It was followed by a beach barbecue at Loch Morlich and then a small flotilla of kayaks and canoes set off to explore hidden corners of the loch. Running around kept everyone warm during some of the week’s evening activities such as football, frisbee and Susan’s games night. Other evening activities included a quiz, the traditional dorm inspection and a “song” competition that didn’t involve much singing. On Friday morning, S1 cleaned Nethy House to our usual high standard before the return to Gairloch. Thanks to the many staff and other volunteers who contributed to the success of this week, with a special mention to Ann Fraser and Susan MacLean who fed us well throughout the week and kept smiling and Fiona Johnston who organised all the activities and Dr Caley who coordinated the week. Thanks are also due to S1 for their enthusiasm and for being a great group to work with. As usual there are lots of pictures available on the school website – click here to view them all. Primary 7 Icebreaker and Expressive Arts – P7 Pupils were in the High School on Thursday 20th May – traditionally known as Icebreaker Day. However, P7 pupils have already met each other recently, at such events as, Safe Highlander, Fairburn and more recently Choices For Life. Mr Milner and Mrs Beeson, Children’s Services Worker, spent the first part of the morning getting the pupils to interact with each other through a mixture of tasks. Building towers in groups of 5 from spaghetti and marshmallows was entertaining if somewhat messy. The idea was to construct the tallest tower in a limited amount of time and so get the pupils to discuss ideas and develop teamwork. On the 21st May P7 pupils returned to spend the day working on dance, art and music to create and perform a short dance sequence. Staff and the current S1 pupils saw this excellent little show at the end of the day. Thanks to Mrs Hildrey, Miss Hunter and Ms Gulliver for orchestrating the event. Click here for some photos of the Expressive Arts event. ICT Technician Vacancy – Recently the Council has taken on a new ICT Managed Service with Fujitsu. Our ICT Technician, Trevor Nash, has accepted a promoted post within the new structure and the company now requires a new full-time technician to service the local schools. Anyone interested should contact the school in the first instance. Another successful trip! Click on the photo to view photos from this year and previous visits to Nethybridge. Arrangements for pupils about to transfer to High School Moving to secondary school is an exciting, yet potentially worrying, time for Primary 7 children. The staff of Gairloch High School will be working between now and the summer, along with Primary staff, to ease any concerns that the children have through a series of meetings and events. Mr. Milner, Principal Teacher for Pupil Support and Mrs. Beeson, Children’s Support Worker, are currently visiting all associated primary schools to introduce themselves and talk about transition. We also provide opportunities for parents to meet with staff. All P7 pupils will come together for a Choices for Life event and a Fairburn Day. Staff from the High School will be present supporting Primary colleagues. On Thursday 20th May all P7 pupils will have the chance to visit the High School and take part in our Icebreaker Day. On Friday 21st May pupils return for an Expressive Arts Day organised by Art, Music and PE staff. Further visits take place in June prior to the pupils becoming S1 pupils in August. SQA Exams – All S4, S5 and S6 are now sitting their final exams. We wish them well and hope that their efforts in class and at home preparing will be rewarded. Please support your sons and daughters by encouraging them to make the best use of their study time before exams. Pupils can make attend organised study facilities at the school even on days when they have no exams. Our GHS Mock Election saw a high turnout on Friday 23rd April. 84% of pupils cast their vote, much higher than the national average, which is only around 60%. The most popular party was the Green Party, represented by Jade. She took 24% of the votes, closely followed by the SNP, represented by Joanne with 19%. Storm and her Lib Dems and the Labour Party, represented by Jennifer came third and fourth. Many thanks to the Higher Modern Studies pupils for putting the time and effort in to organise the event. Also a special mention to 2A, as they were the only class with a 100% turnout. Well done!! Duke of Edinburgh’s Award – Our first Bronze camping expedition of the year took place at Slattadale on the night of Friday 7th May. After school four groups of pupils set off walking from Poolewe down the side of Loch Maree to pitch camp at Slattadale. It was a clear sunny weekend but cold overnight. Most of the pupils reported having a great time but little sleep! Thanks to Dr Caley, Miss Dean, Miss MacAllister and Mrs Bulmer for supervising. S1 have received the first part of training in radio production techniques. With the help of well-known BBC Scotland radio presenter Anne Marie Goldie pupils learned interview techniques. This project will continue through the term and will hopefully involve some work with the local radio station and the creation of a short programme fit for broadcast. As you read this S1 will also be returning from their week of activities at Nethybridge. We will report on this in next issue but you can view some photos by clicking here. 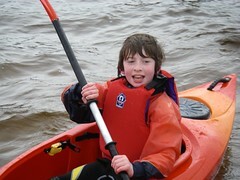 S2 pupils recently spent a day down at Slattadale taking part in a range of activities. Thanks to Mr Sutherland for putting this day together and all the staff supporting. Activities involved mountain bike and photography skills, environmental awareness including flora and fauna talks from SNH and Forestry. Click here for some photos. S3 are just completing a week of enterprise activities that include working out with the Royal Marines, drama, photography and first-aid certification. Click here for some photos. British Heart Foundation –With the help of some other prefects and prior to exam leave, Harry Valentine raised £96.72 by organising a cake sale. This money has been donated to the BHF. Project Trust in China – We have received some photos from Calum Milner showing the area where he is working in China. These can be viewed here on the school website. Indoor Rowing – Congratulations to the Gairloch High Rowing teams for their excellent performances in this year’s Concept 2 Indoor Rowing League. The S2 girls’ team of Isla, Ainslie, Gemma, Rebecca, Caitlin and Natasha finished 9th out of 325 teams. The S2 boys’ team of Ross, Chris, Donnie, Donald and James were 4th out of 275 teams. And the S3 girls, Mags, Leanne, Charmayne, Morven, Rachel and Mairi were 5th out of 241 teams. The pupils have worked very hard throughout the session completing all 6 rounds of the competition. It is great to see teams from our small school finishing in the top 10, alongside much bigger schools with strong rowing traditions, and way ahead of any Scottish competition. Badaguish Outdoor Challenge – On Saturday 24th & Sun 25th April, Amber Fox, Jasmine Easby, Sandy Garrioch and Jake Bulmer, collectively known as ‘Bread and Butterflies’, took part in a 2-day orienteering event based at Badaguish Outdoor Centre. Following a wet night in the tents on Friday night, 73 teams headed into the forest on Saturday to negotiate a 15km course with 20 control points. Our team were placed 24th after the first day. On Sunday, they set off once more to tackle a 12km course that tested their navigation skills too. The ‘Bread and Butterflies’ team put in a steady performance, moving up another couple of places and finishing in 21st place overall. Well done to all of them. The outdoor challenge is an annual fundraising event organised by the Speyside Trust, a charity that provides opportunities for children and adults with learning difficulties and other special needs to enjoy outdoor and adventure activities. Each team participating in the Outdoor Challenge pledges to raise a minimum of £60 in sponsorship. Click here for some photos of the event. Soup Lunch – The Parent Council are organising a Soup Lunch in Gairloch Community Hall on Saturday 22nd May to raise money as a contribution to support the costs of our Malawian visitors in August (if all goes to plan!) We hope that many of you will support this.